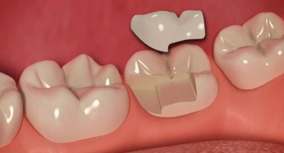 Similar to fillings, inlays and onlays are used to restore a tooth's integrity and function following damage. 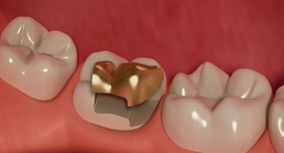 The difference being that, whereas a standard filling is applied directly into/onto your tooth and hardens in your mouth, inlays and onlays are custom-made out of the mouth and then cemented in place. Inlays and onlays are used when the tooth structure is not sufficient enough to place a regular filling and the result is much stronger. 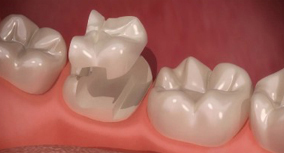 The difference between inlays and onlays is that an inlay is placed inside a cavity on your tooth whilst an onlay replaces the cusp(s) (tips) of your tooth. These two terms are often used interchangeably. After an initial consultation with you to discuss your options, the process of placing inlays and onlays is usually spread over two appointments, although it can be possible to have both appointments on the same day at Smilemakers using the unique Cerec technology. Appointment 2: We may need to numb your tooth again to remove the temporary restoration and bond or cement the new one into place. After this is done, you can walk out with a newly restored smile! The different types of inlays and onlays each have their own characteristics and strengths and weaknesses, some of which are listed below. Remember that these are all relative and that the best person to talk to is your dentist!